'Savannah's Cabana NEWLY REMODELED 1 Block to Kailua Beach! Great attention to detail was given to this separate cottage that was designed to match our Plantation-style home. The main house and this cottage share a beautiful tropical oasis that sits behind two houses offering peace and tranquility. 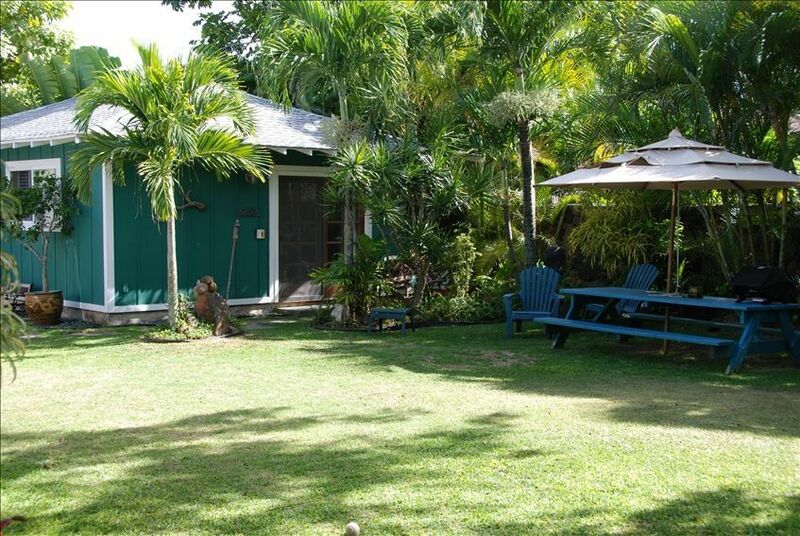 Nestled off the road one block from Kailua Beach, it offers the charm of old Hawaii amid quiet tropical surroundings. This newly REMODELED 1 BEDROOM cottage boasts all of the upscale details and furnishings you would want for a lovely vacation getaway. 'Savannah's Cabana' offers a modern FULL KITCHEN full size refrigerator with new appliances, granite counter tops, and a granite dining table. The bath's stone and glass shower will refresh you after a day at the beach. A comfortable KING-sized bed with the finest high quality 'Tommy Bahama' linens assures you a peaceful and restful night’s sleep. The cottage is luxuriously appointed with 'vintage hawaiian' fabrics, custom built in furniture and hand selected art work. The grounds are beautifully landscaped abundant in tropical palms , orchids ,and rock garden sculptures. Off street parking is right next to your cottage. Kailua is a lovely beach town that is tucked away on the Windward side of the Koolau mountain range. It offers a nice getaway from the fast pace of Honolulu and Waikiki but is a quick 25-minute drive if you should choose to head into town. Kailua also has a wide variety and great selection of restaurants and boutique shopping. The beaches of Kailua and Lanikai are rated amongst the most beautiful beaches in the world. Our bay is protected by a reef and provides a gentle place to play, offering an abundance of activities such as windsurfing/kitesurfing, surfing, kayaking, body boarding, snorkeling and swimming. This is truly one of Hawaii's greatest pieces of paradise because of the tranquil aqua blue water and the green backdrop of the Koolau Mountains. This is one little special place in Hawaii you won't want to miss. Our stay at Savanah Cottage was perfect, can not think of anything that we would change. Terry and David were friendly and perfect hostes. Location was quiet and a pleasant short walk to a beautiful beach. We loved our stay. Terri and Dave are great hosts. Only wish we could have stayed longer. Such a sweet peaceful place! The cottage was perfect for just the two of us! It has everything you need and just two blocks to the beach! Dave was welcoming and helpful and just the drive down the driveway was so beautiful and made you feel like you were truly at the beach in Hawaii. We would definitely recommend it!! Our stay in Savannah's Cabana was very enjoyable. The Cabana is located on the property of the owners, who are very personable without being intrusive. You are close to lovely Kailua Beach and the walk through the neighborhood is pleasant. Kailua has many great restaurants, don't miss Kalapawai Cafe & Deli. .Kailua is a great beach town and a perfect location for exploring Oahu. Savannah's Cabana is our absolute favorite place to stay in Kailua. Terri and Dave have really created a special place. The cabana is spotless and tastefully decorated, and it's equipped with everything you could possibly need, including your own washer and dryer. Plus, the location is perfect -- it's on a nice residential street only one block from a beach access path, and away from the more crowded parts of Kailua Beach. Aside from the charming accommodations and ideal location, Terri and Dave are the perfect hosts. They're available for anything you need during your stay but also let you do your own thing. You'll wish you never had to leave! Savannah's Cabana is the nicest VRBO I've stayed in yet. It's clean, well appointed, and has all the kitchen, laundry, and beach things you need. The yard is beautifully planted and there are chairs and a big picnic table for being outside. It's very convenient to the beach and the owners, Terri and Dave, are gracious and very helpful. I will definitely return. Thank you for your business and leaving the cottage so clean and tidy. We enjoyed meeting you and your family. Please return one day soon. Windsurfing/Kitesurfing/Kayaking/fishing/snorkeling/swimming/boogie boarding/body surfing/beach walking/bicycling, world class bone fishing. Ask us about one of the best guides for bone fishing. This is a non-smoking property. No smoking allowed anywhere on the property. This property will only except bookings to accommodate two people. No family of 3's unless approved by owner. $50/day charge for the additional adult or child. Either parties have the right to cancel within 30 days of arrival date.